Back in the late 1990s and early 2000s I started putting in for bighorn and desert sheep tags in all states that had a draw in hopes of someday drawing a tag and fulfilling a lifelong dream of hunting these majestic creatures. Like most that do the same, winter is filled with anticipation and optimism as draw deadlines come to a close and the wait begins for results to post. Year after year, “unsuccessful” was my only result – until 2015. 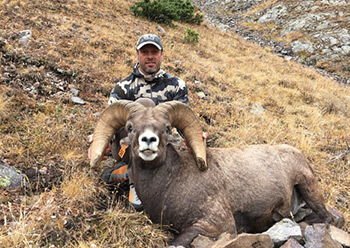 I was once again checking Colorado draw results for the 1000th time when I read “successful” for bighorn sheep. I scared my wife half to death. She’s never heard me scream like that before and came running downstairs to see what had happened. 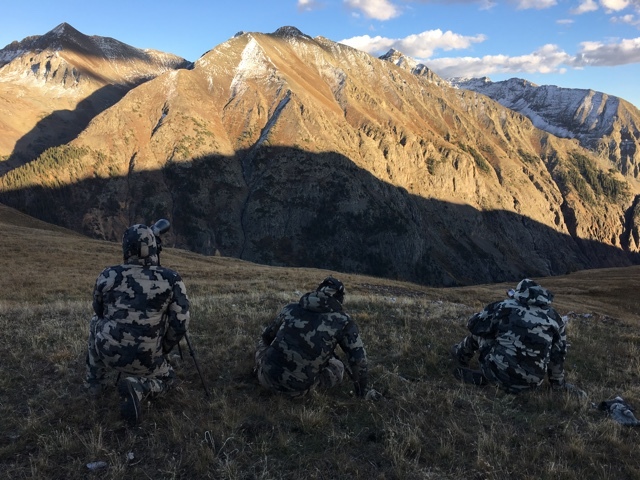 Guiding sheep hunts lets me spend an incredible amount of time in sheep country every year, but this would be the first time I would be the hunter since 2001. I had been putting in for the same unit for the past several years. The unit has lots of sheep, is relatively rough, and has good draw odds for residents. I was excited to get out there and see what I could find. My goal was to take an old warrior of a ram, 10+ years old. I wasn’t concerned about score, but age was absolute must for me. A good friend of mine, Terry Marcum, put me in touch with another sheep nut, Rich Weyer. I met Rich and his friend, Josh Capalbo for a day of scouting in early July. Although we didn’t see any sheep that day, I was excited to see the country and get a feel for what the terrain was going be like. 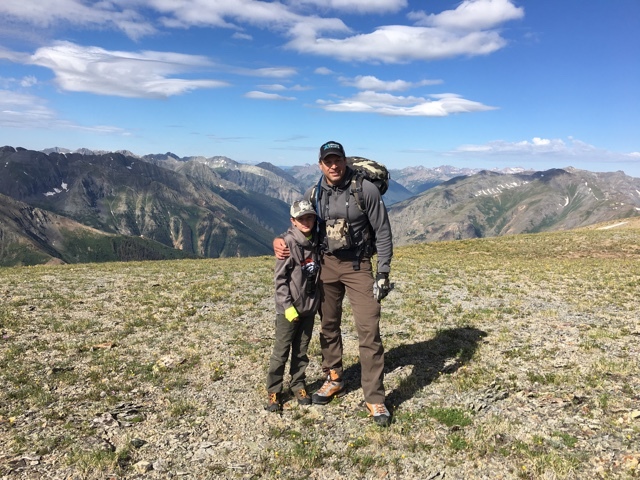 My 9-year-old son and I made another weekend scouting trip with Rich before I was to head back to the Yukon where I guide Stone Sheep hunts for Deuling Stone Outfitters. On that trip, we found several rams (17) with 2 filling the age requirements I was looking for. One of the rams had an orange ear tag with number 58 on it. Rich named him after Denver Bronco linebacker Von Miller. I was treating this tag as a once-in-a-lifetime tag. After finding a ram I wanted, I couldn’t wait for the season to get going. I wanted to get to my unit a couple days early to set up and see if we could relocate one of the 2 rams we found in July. I met Rich and we hiked in and set up spike camp. Josh would join us a couple days later. We located one of the target rams a few ridges over from camp and watched him for the day. 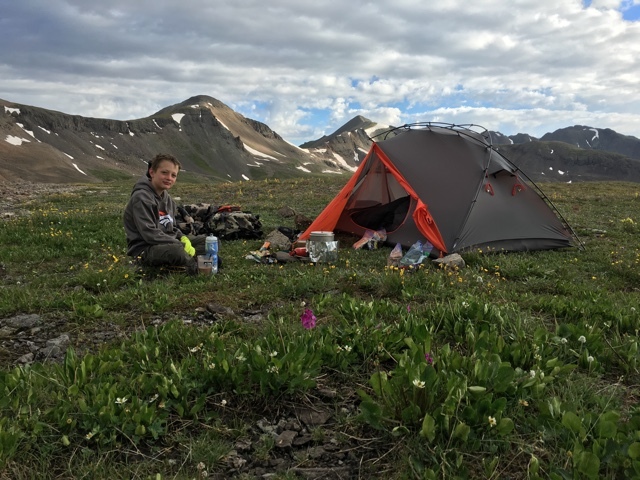 As usually happens on high country sheep hunts, weather rolled in and had us stuck in tents for the rest of that day. The little town at 9,500 feet had recorded 65 mph wind gusts. 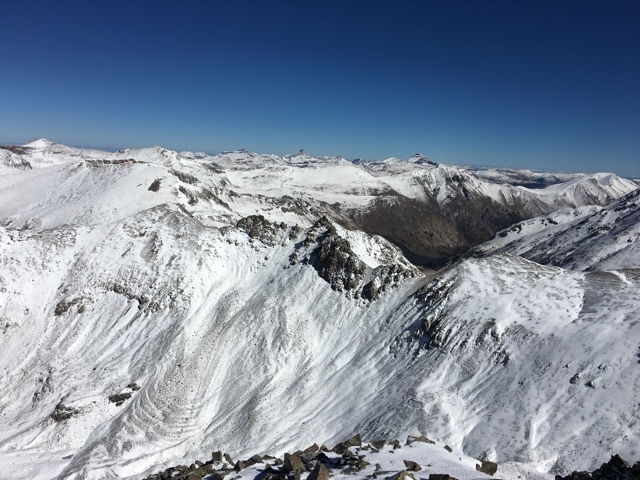 We were camped on a ridge at 13,000 feet. I am not sure what the actual wind gust speed was, but it was by far the worst wind I’ve ever been in. 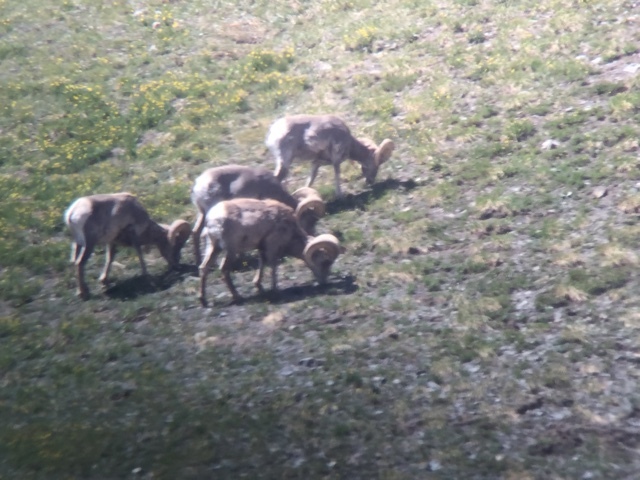 We were able to get out in the early afternoon of opening day and after a couple hour hike, I located the band of 6 rams Von Miller was in. The big open bowl was not conducive to a stalk, so I decided to wait and watch them until close to dark in hopes they would move. Again, that evening the weather blew in, and was relentless. Lightning, wind and blizzard conditions literally blew us off the mountain. We had to relocate to lower country. The wind was blowing so hard and sleet hurt so bad, we had to walk backwards in the open ridges. I had hoped the weather would keep the rams close to where I’d last seen them, but it wasn’t to be. We searched high and low for the next 2 days without turning them up. I decided we’d drive up an old mining road on the opposite side of the valley in hopes of finding the rams. Late in the day we found them a couple miles from where we last saw them, but now they were in some nasty cliffs. Although I knew we could get to them for a shot, I was worried we would not be able to recover him. We decided to keep watching them in hopes they’d move to a safer, more favorable location. For the next couple of days the rams stayed in an unfavorable area, so we just watched from a distance. Finally, they moved into what looked like a good spot for a recovery, so we hiked up thru the cliffs in hopes they’d continue to move closer. However, when we got up there we couldn’t relocate them. Turns out they went low into a portion of the cliffs we couldn’t see. As it was getting late I decided we’d head back and try again in the morning. We were driving back down the mining road when I looked up just above tree line and saw them. Back we went up the road and I made a mad dash up thru the cliffs to close the distance. 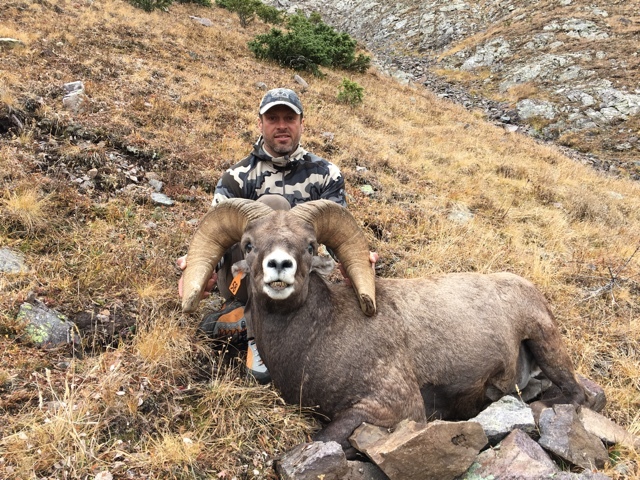 I was able to get 290 yards from one of the 9-year old rams in the group but because of the terrain, I couldn’t see the others. It wasn’t the ram I wanted, so I passed and hiked down in the dark full of optimism for the next morning. I wanted to put eyes on them before making yet another climb up thru the cliffs, so I went up the road and was able to find them immediately and in a great spot. Up and thru the cliffs we went and popped out on a knob and located Von Miller – at 300 yards and on a steep downhill angle. I got set up on my pack and felt solid, reconfirmed the distance and made the shot. After 9 days of hunting, I had my ram. I was in awe of how much bigger body size bighorns have over thin horns. They are an amazing animal. After photos, butchering and caping, it was time for one last trip down thru the cliffs. I hope to be able to hunt bighorns again someday and will continue to apply in all states and purchase raffle tickets and hope to get lucky. This hunt was everything I could have asked for. It was one of the most physically and mentally demanding hunts I’ve ever done. My ram was 11.5 years old, heavily broomed to 30 x 31 with just under 16-inch bases. An ancient old warrior I am proud to have taken off the mountain.